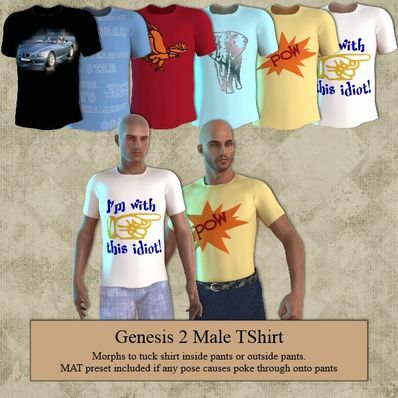 TShirt for Genesis 2 Male for use in Daz Studio 4.6. Morphs for inside pants and outside pants included. Alos a MAT preset to hide the lower part of the shirt if there is any poke through on pants when using some poses. I have also included several Textures. Thank you very much! Donation incoming! Thank you for sharing, love your work.